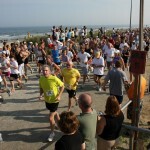 A ten mile running race (46th annual) along South Jersey’s ocean front that utilizes chip timing. A must for runners looking for something slightly different from the traditional road race. Seven and one half miles are on the beach. The remaining two and one half miles are on a black top macadam boardwalk. The race occurs at low tide which means you will not be running on soft sand, but on hard packed sand similar to a dirt trail. The course is traffic free and flat. Visit our website, www.sicbp.com, for more information.